Not all work can be done by a machine, even in our tech world. 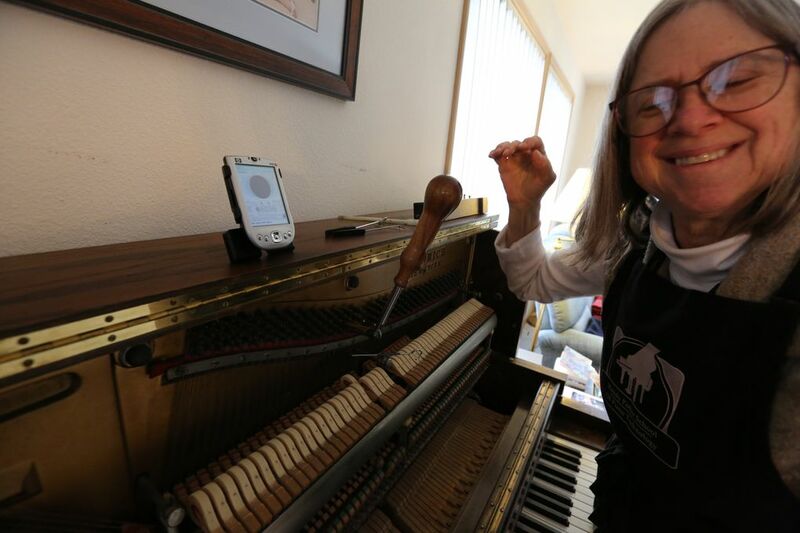 GINNY BEAR tunes pianos for a living. Back in the day, that statement would have been about as remarkable as saying, “Ginny Bear eats baloney.” But here in the new digital economy into which some of us have leapt, and others are still being dragged, it actually makes the West Seattle woman — and others who still have jobs where stuff is accomplished by skilled manual labor — stand out. 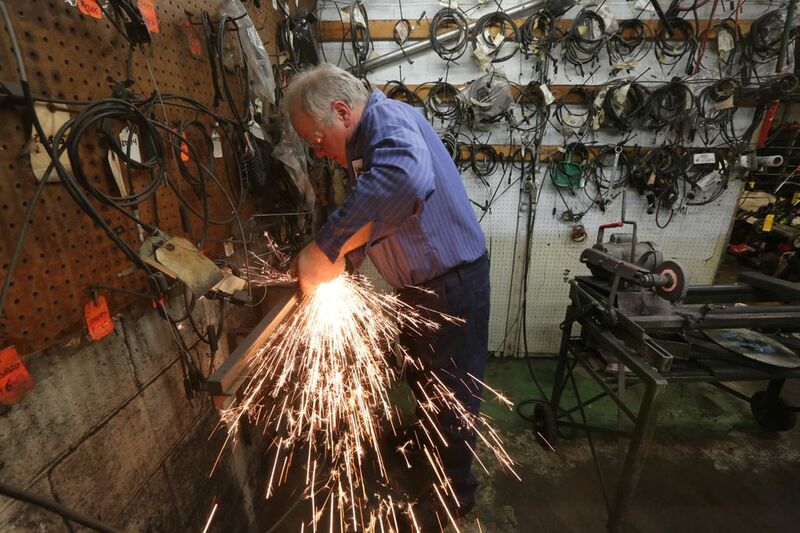 The distinction seems especially glaring around Puget Sound, which was “settled” two centuries ago largely by Europeans who fought the war against nature through hand-to-hand combat: hands on crosscut saws, hands on fish nets, hands on plows. That was then, tech is now. But that postindustrial revolution is, and to some degree always will be, incomplete. It might sound odd coming from a place where new 737 wings are being punched out via robotics, but not everything can be turned over to machines. Nor should it. 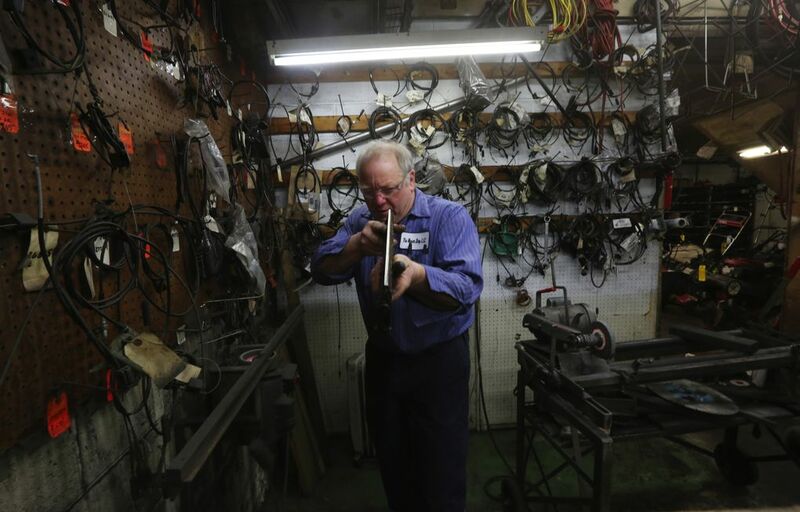 Bear’s work, assisted by technology but impossible to accomplish without basic tools, produces a tangible product — a piano that plays in key, itself a potential tool for great artistry. You can look at the piano. You can touch the piano. You can put flowers atop the piano. And most of all, you can play the piano and hear and even feel her handiwork flow from its keys and pedals. Not that long ago, almost every job was like that. Today, many still are, but they have been relegated largely to the lower tiers of pay and what society might consider “success.” The sociological impacts of that can be, and should be, debated. But there’s value, in the short term, in at least acknowledging the shift. In an era in which our youths are aggressively warned away from pedestrian, artisanal career digressions — “Every kid in America should learn to code!” a popular magazine treatise recently scolded — we here at Pacific NW thought it might be instructive to pop in on a few random local people still doing “real jobs.” By this we mean older jobs that have survived, for many decades, either by necessity to provide a still-valued service, or by the sheer willpower of workers who value the satisfaction arising from an uncluttered cause-and-effect occupation. They are fewer, but you don’t have to look very hard to see those people still out there, working, quietly keeping the world we knew, embraced and mostly lost humming right along, like background music to a people and place with an increasingly tech-dominated lifestyle. A decade ago, Bear, now 64, was an administrative assistant in the health-care industry. In her mind, she was more of a “craftsperson” who had been miscast. But what craft for this person? She had always been musically inclined, in fact played percussion in local music groups. While noodling all this, her husband, Chuck Sanders, claimed to know for a fact that piano technicians (a job performed by his late brother) were in demand, that the work was easy to learn and that it paid quite well. None of those things turned out to be exactly true. But Bear didn’t know this until she was already well down the path. Now, she does the work more or less full-time, making enough money to support her share of family expenses. And for the first time, she can say she loves her job, especially the broad range of people it brings her into contact with. Here is what it entails: Once dispatched on a piano house call — mostly through her website, some through referrals from former customers or music teachers — Bear arrives at a home and assesses the problematic musical beast. This involves opening up the piano, which might be anywhere from, say, 100 years to a couple years old, to get at its guts, especially the tuning pins. Bear can tune a piano by ear. But she uses a digital device to hasten the process — “Reyburn CyberTuner” — on a pocket PC. It listens to her play five notes, then constructs its own tuning for every note on the keyboard. The microphone listens in and refines its note construction periodically as she moves from lowest to highest notes, adjusting the pitch by tightening or loosening piano strings, not unlike on a guitar. This sounds simple but often is not, thanks to the “Rube Goldbergian” (millennials, Google it) structure of pianos, which will employ a group of two or three strings to make an individual sound for each black or white key. “When I’m done, I play single notes from top to bottom, then octaves from bottom to top, adjusting tunings as I hear the need,” she says. She plays a few actual tunes (secret info here: These are basically the only piano tunes she knows) to check out the full range. It usually takes up to two hours, and she charges $130 for a basic tuning. 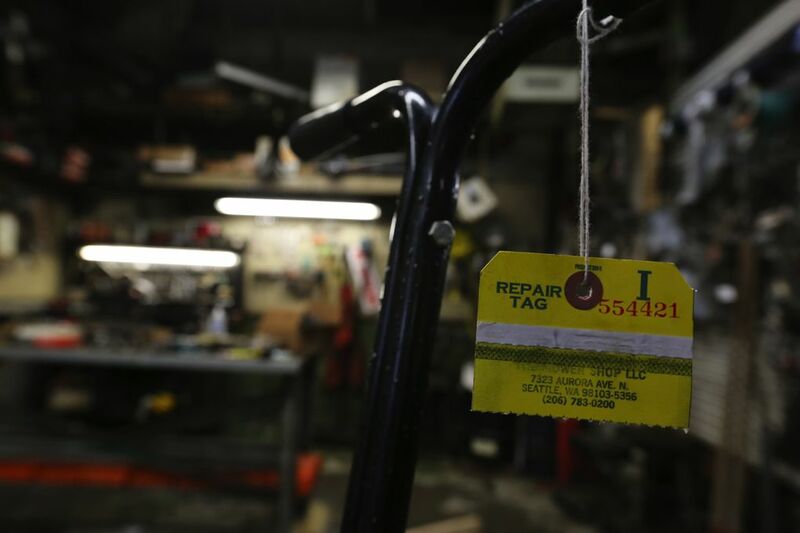 The big picture: There’s really not a “shortage” of local tuners. 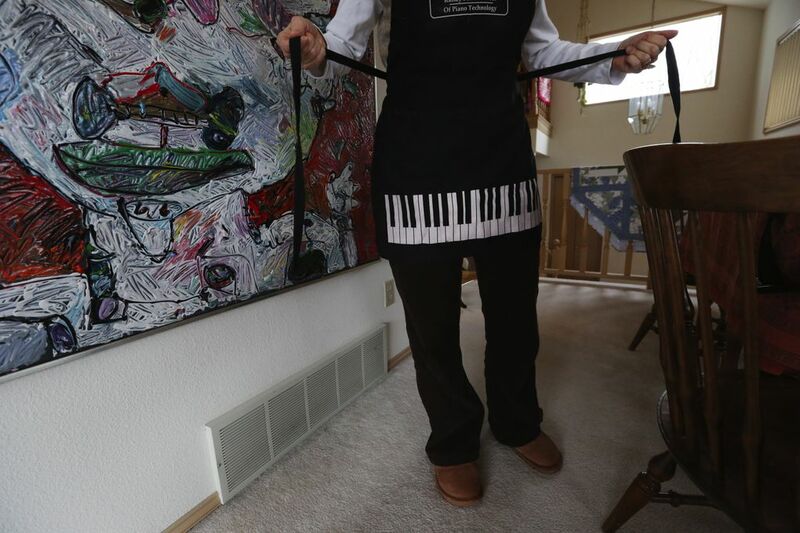 The area Piano Tech guild already has 50 or 60 members. But long-term prospects look good to Bear. Despite what you might think about pianos being largely “replaced” by cheaper digital keyboards (a much-lesser acoustic experience, Bear warns), old pianos don’t really go away quietly — if at all. They just get hauled by reluctant, sweaty guys on weekends to a new location. “You have to make a piano go away,” Bear says. KURT GOODALE grows oysters. 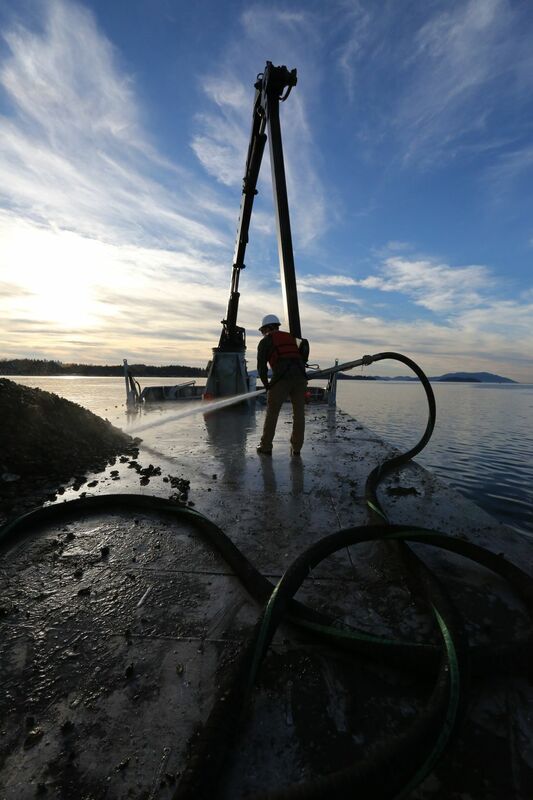 Like most workers at shellfish farms — ranging from mom-and-pops to substantial corporate entities — he is a sort of jack of all muck-related trades at Taylor Shellfish Farms’ Samish Bay operation. Many things have changed about oyster growing in the past century. The most fundamental have not: You put out baby oysters and let Puget Sound nurture them to slurping size. Once they’re out of the hatchery, all work on oysters is done in shallow bays at low tides. In winter months, those tides are dead-center in the middle of the night. Thus, most work in the oyster beds — moving, crating up, spreading, redistributing and other tinkering — is a graveyard-shift proposition. You never really get used to that, and turnover for beginner jobs is high. But some workers get hooked on the fresh air and simple pleasures. And they stick with it. Goodale, 27, a graduate of Western Washington University and an aquaculture program at Bellingham Technical College, has been at it for a few years. He’s one of the employees being groomed for the longer haul, a designation that comes with a few perks in addition to ultra-fresh oysters. One of them is skippering the Janet P. The boat, a shiny new aluminum behemoth, weighs about 70,000 pounds but draws only about 18 inches of water. 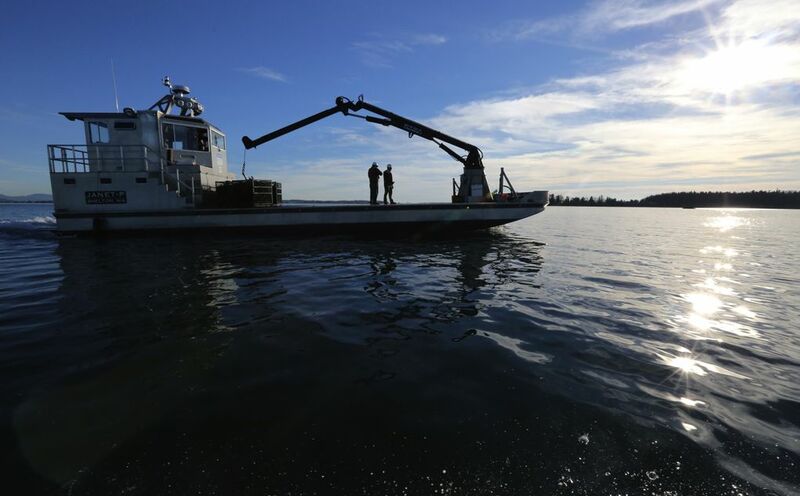 It’s the perfect craft for heavy-duty oyster farming in Samish Bay, where most floating work on company oyster beds is conducted in water less than 6 feet deep. 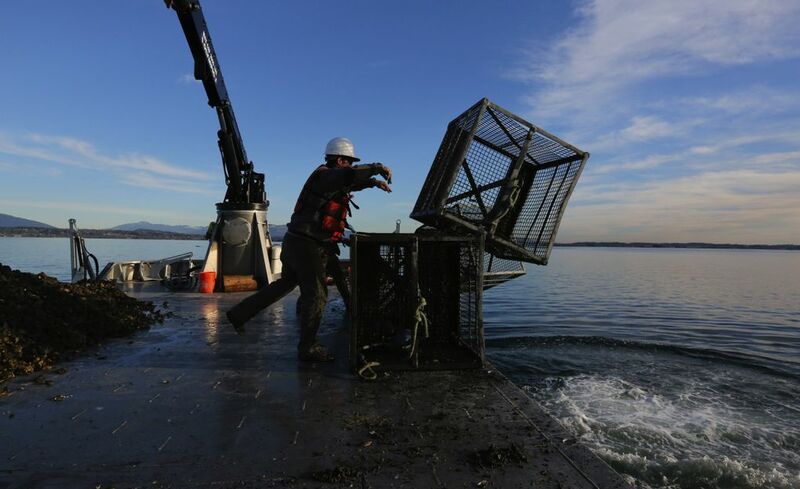 On a recent, unusually springlike winter day, Goodale, a Marysville native, piloted the Janet P out of a slip and across the bay, where a dozen metal crates had been filled by hand, during the previous night’s low tide, with about 200,000 oyster “seeds,” or small oysters. Goodale’s job is to snare a float hanging from each large crate with the boat’s Space-Shuttle-sized hydraulic arm, lift it on board and dump its contents onto the deck. After the boat moves to the new growing bed, another worker employs a water cannon to spread the payload across a broad area, where the oysters will grow to maturity for harvesting later this summer. The boat, with a crew of three, accomplishes in about two hours what it would have taken more people working by hand at least a day to accomplish. 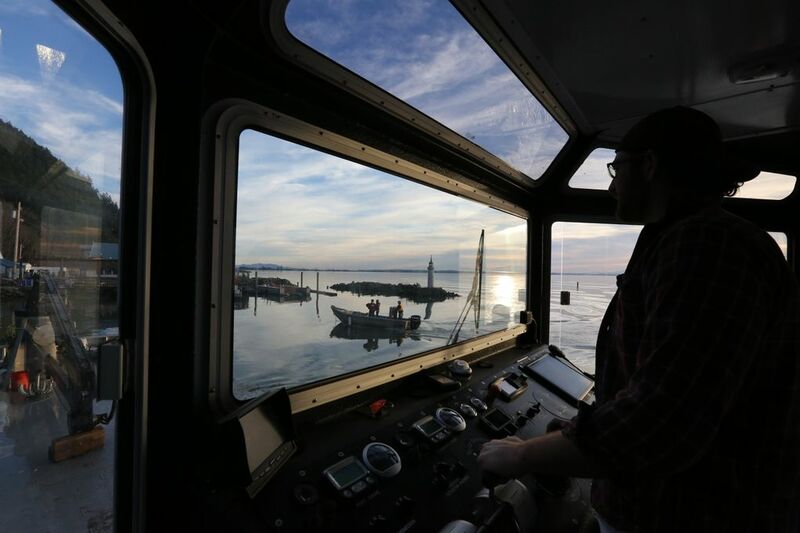 Most oyster farming is old-school work, through and through, but made more bearable by technology — including GPS gear to define bed boundaries and, in the case of the boat, diesel-engine, jet-propelled horsepower. 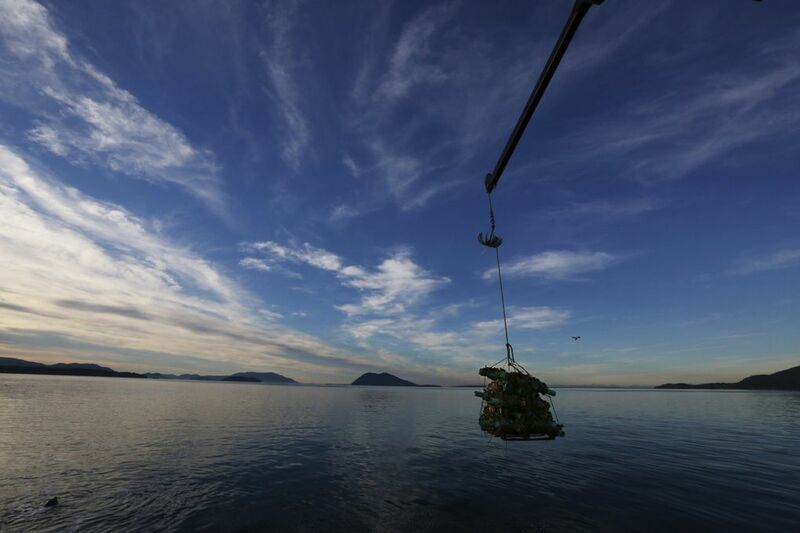 Taylor Shellfish workers distributed close to 6 million oyster “seeds” this way on the beds of Samish Bay last year. What’s the best part of the job? 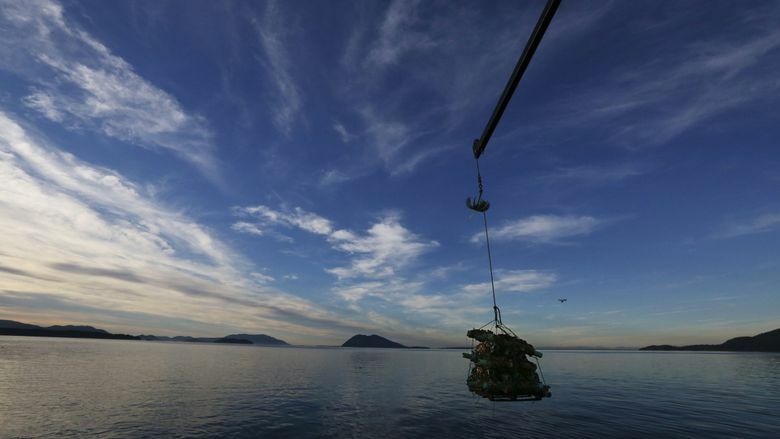 “This part,” Goodale says, waving an arm around the boat’s spacious cabin to its broad front windows, where a truly stunning view of Mount Baker, the Chuckanut range, the San Juan Islands, British Columbia Coast Range peaks and the Olympic Mountains appears in 360-degree succession. It is not inherently dangerous work. The crew jokes about potential reality-show scenes, a la “Deadliest Catch,” that might occur in a bad squall in Samish Bay. (If the workboat sank, the crew would just be sitting there in a few feet of water, dry from the waist up, highly embarrassed, but not drowning.) But it is quintessentially Northwesty — to the point that you could almost picture Goodale and his crew in a Filson ad (which you actually might see; another story). JONAH KNUTSON catches fish. Lots of fish, in nets, not unlike the way the job has been performed for millennia. Like most Seattle-area commercial fishermen, Knutson, 36, who learned the craft at the side of his father, Pete, spends summers in Alaska, pursuing chum, sockeye, coho and pink salmon on his gill-net boat, Loki. And also like most of his peers, he spends large chunks of time in winter hanging nets. The process of “hanging” a gill net is not quite what you might envision. Some fishermen still mend large nets, such as purse seines, in impressively tall buildings with nets strung from the rafters (go see the historical photos in the port offices at Seattle’s Fishermen’s Terminal). A basic “hanging” of a modern gill net for summertime use is a smaller-scale, methodical process of affixing pre-made nylon mesh with top lines (a “cork line” and “weed line”) and bottom lines (AKA “lead line”) for unfurling and collecting in the saltwater. The hanging process will differ depending on the net’s intended use. Bristol Bay fishers expecting net sets to produce many tons of fish, reliably, all at once, will use a “tight” hanging technique, with more attachment points between the mesh of the net, and its top and bottom lines. Knutson, expecting smaller catches per net set in his favored waters around Ketchikan in southeast Alaska, and more concerned about retention rates, will use a “looser” construction. This way, the net has more flex and will ensnare more fish that get wrapped up in its fluctuating folds, not just caught by their gills swimming through the mesh. There are mathematical formulas, beyond the comprehension of most of us without sandpapered hands, that combine mesh size, total net size, intended fishing depth, local fishing regulations, water conditions and other ephemera to dictate exactly how a net fisher will spend his or her days by the fireplace in winter months. For Knutson’s intended fishery, this involves opening up the Loki Fish Company net locker at Fishermen’s Terminal, straddling a wooden “hanging” or “measuring” bench (inherited from an old-salt predecessor, Bruce Wilson, AKA “Joker Bruce”) and getting down to business: Holding a throwback-device mending needle in one hand, Knutson unfurls twine to tie thousands of individual clove hitch knots, connecting his net lines to every fourth section of mesh. Pull, hook, wrap, tie. Repeat for a half or all day, as necessary. Fifty fathoms of net might take about three hours for the top ties, another three for the bottom. 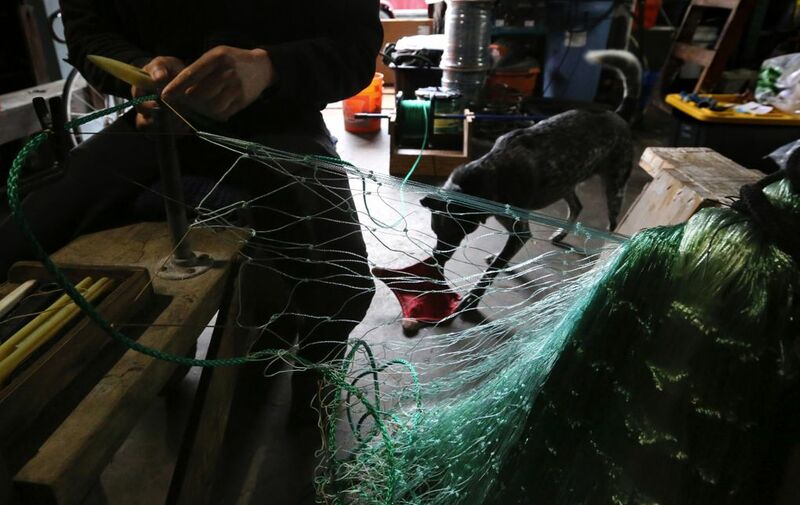 That’s about 12 hours for 100 fathoms of standard net — or more, depending on other factors, such as degree of patience by Knutson’s cork-float-nibbling canine companions, Snickers and Monty. He worries about ocean acidification and other obstacles to long-term salmon survival but is pleased to see Alaska’s runs, for the most part, hanging on. It’s a living, and “an anachronism I delightfully embrace,” he says. Like other local people with potentially “legacy” jobs, Knutson would just as soon not tempt fate by talking his to death. And like his peers in other skilled work, he can’t really picture himself giving it up for something involving a track pad and glasses with office lenses. For some people, a successful career is not simply getting out of an office and away from a digital device. It’s all about avoiding them in the first place. Ron Judd is a Pacific NW magazine staff writer. Reach him at rjudd@seattletimes.com or 206-464-8280. On Twitter: @roncjudd. Alan Berner is a Seattle Times staff photographer.